David McNabb Pallet Mfg. Inc.
David McNabb Pallet Inc. produces pallets in standard configurations and custom sizes. Please examine the information on this page to determine and describe your requirements. Pallets are available in a 2 way entry style (no notches), 4 way or either. The deckboards can be produced flush to the stringer, or Single Wing (top deck boards protrude over the stringer edge) or double wing (top and bottom deck boards extend over the stringer edge). Pallets can be produced with stringers for lifting or solid (block) sides. When ordering custom pallets please specify stringer length, width, height and number. When ordering custom pallets please specify Notch length, depth and location. When ordering custom pallets please specify the length, width and thicknes of the inner and end top deck boards. Also specify the number of inner boards. The end boards must be identified as flush or wing assembly. If wing please indicate the length of wing. 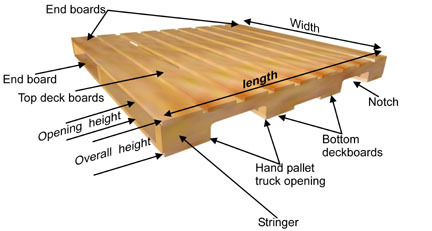 When ordering custom pallets please indicate the length, width, thickness and number of the bottom deck boards. Please also indicate if the end boards on the bottom deck are flush or wing. If wing design is required indicate amount of extension required.